Distillery Manager Christopher Williams, assistant Sam Zurofsky and Master Distiller Angus MacDonald starting a rye whiskey mash. Dotted as it is with monasteries and old orchards, and with magnificent views of the Hudson River and the estates of Dutchess County on the other side, one can easily imagine life in the 1800s on the bucolic stretch of Route 9W that hugs the river as it passes through the town of Esopus. A newcomer to this stretch of highway, Coppersea Distillery in West Park feels right at home in this setting. Angus MacDonald and Christopher Williams, the boots on the ground at Coppersea, together with their business partner Michael Kinstlick, are reviving traditions of distilling that go back to the 19th century and well beyond. Housed in what was once a print shop for the Holy Cross monastery, MacDonald and Williams refine an ancient art once practiced only by alchemists, converting ordinary grain into liquid gold. The craft distilling industry is undergoing explosive growth right now, according to Kinstlick, who has authored a white paper on the subject, a link to which can be found on the distillery’s website (Coppersea.com). In 2000, there were approximately 25 craft distilleries in the United States; today, the number approaches 250. Much of this growth can be attributed to a change in the law that permits small distilleries to operate under the designation of “farm distillery.” This legislation was spearheaded by Ralph Erenzo of Tuthilltown Distillery in Gardiner, a pioneer in the craft distilling movement that produced the first legal whiskey in New York State since Prohibition as well as its very first Bourbon. Coppersea’s Raw Rye Whiskey among barrels of aging whiskey.. The word whiskey comes to us from the Gaelic uisce beatha, meaning ‘water of life’ or, perhaps more accurately, “lively water.” In Latin, aqua vitae was the name given to any distilled spirit. What we now call whiskey is really the result of centuries of experimentation, innovation and, to a great extent, what might be called “happy accidents.” But the basic process of distilling spirits from fermented mash remains as primal as it was when it was first practiced in the monasteries of Medieval Europe in the 13th century. Coppersea’s flagship product is their Raw Rye Whiskey, which begins with a “green malt” process that, according to Williams, the distillery’s manager, hasn’t been practiced much in the past 300 years. 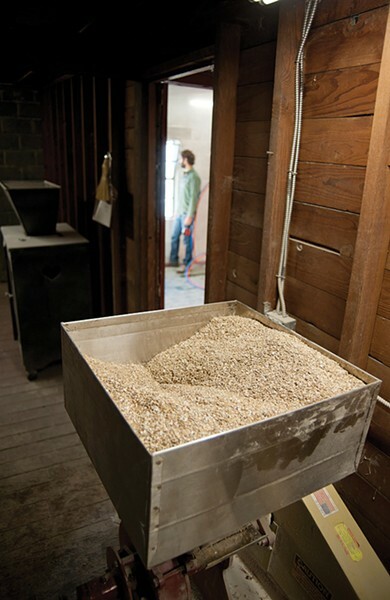 The grain is set out in a layer an inch or two thick on the floor, where it is watered down and allowed to sprout, releasing enzymes that convert the complex starches in grains like rye and corn into simpler sugars that are made available to be consumed by yeast. “There’s an ideal moment in time when the enzymes become fully bio-available but they haven’t gone to work on the starch,” explains Williams. “When you kiln it to different degrees to arrest this process, you get different flavors. But ours tastes like ‘sprouts’—it has a decidedly herbaceous, green note, more like tequila. For a batch, we do 500 pounds, called a ‘piece of malt’ when it’s on the floor. We can use any grain—if you don’t malt your own grain, you’re limited by what’s available.” In keeping with their farm distillery designation, all of the grain used by Coppersea is grown in New York State, most of it locally in Ulster, Dutchess, Delaware, and Albany counties. In our state, rye is very often planted as a cover crop that is usually plowed back into the soil. 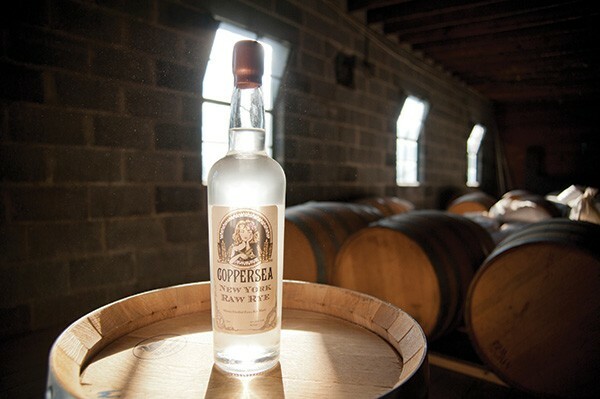 With its emphasis on producing rye whiskey, Coppersea is able to get more from this abundant resource. Rye whiskey was the traditional whiskey of New York State, which, according to MacDonald, was the third or fourth largest whiskey producing state. “If you walked into a bar in Ulster County in the 1800s and asked the bartender for whiskey, they would have poured you rye,” he says. The malted grain is combined with more grain, water, and yeast in 500-gallon Douglas fir vats made by the Hall-Woolford Company in Philadelphia, which makes such barrels for water towers and also sells them as hot tubs. 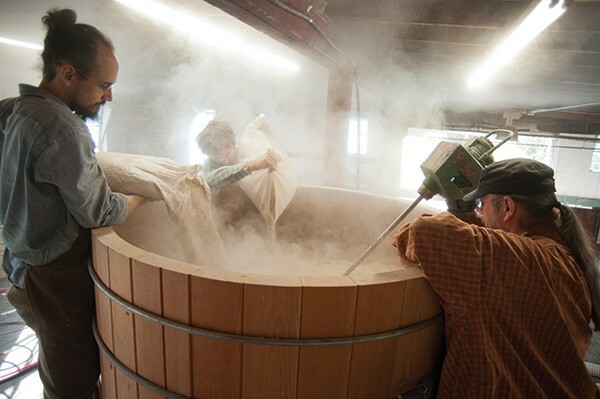 “The mash is open-fermented, which allows ambient yeast from the area to float in. 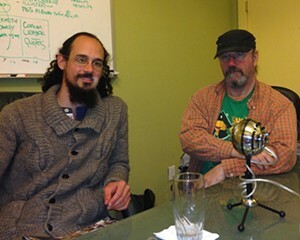 We want that—it’s going to give it character, terroir, which is what we’re going for,” says Williams. And, in a process equally familiar to bakers, the yeast eats the sugar and releases alcohol and carbon dioxide. Coppersea is one of very few distilleries in this country that malts its own grain, and one of only a handful to use green malt. Hudson Valley rye grain awaits milling. Christopher Williams dumping fermented mash in the still. Christopher poured samples of Coppersea’s raw rye, cherry, and their award-winning peach eau de vie, and—this writer’s favorite—a “Slivovitz”—plum eau de vie traditionally from Central and Eastern Europe. Those herbaceous green notes were indeed detectable in the raw rye, and tasting it so close to the source gave one a sense of understanding that lies at the heart of what makes a handcrafted product unique. Each of the eaux de vie offered a big nose full of fruit, with notes of almond in the cherry. And the Slivovitz rivaled any that your Moravian uncle might make. The gentlemen of Coppersea Distillery can be found at the Kingston Farmers’ Market every Saturday, where they have the Raw Rye available. 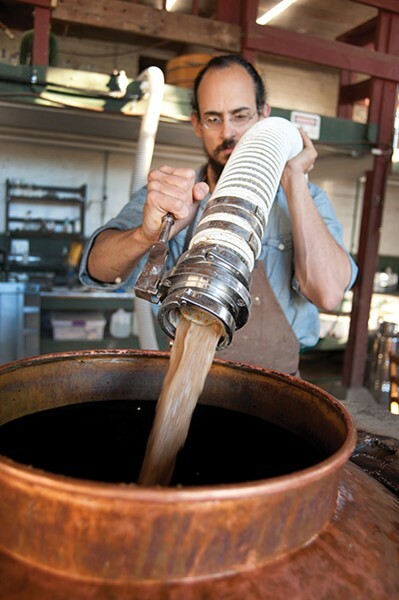 “This was the first year that farm distilleries were allowed to sell at farmers’ markets. One of the reasons we haven’t filled too many barrels for aging is the popularity of the Raw Rye,” says Williams. “We knew it was good, but we thought it would take more of a learning curve to catch on. We went to the Kingston Farmers’ Market the first couple of weeks and sold out of the cases that we brought. Our expectations were very modest—I thought, ‘Okay, we can communicate the brand, learn how to talk about it properly and if we sell three bottles in one day, I’ll be stoked.” And we were selling out—we had to miss three markets in a row just to get stocks back up, because our process is slow. The demand is there and the product is great, so it’s difficult to put it aside—but now we’re finally getting a rhythm going where we'll be able to begin working mashes intended for barreling into the rotation." “The cognoscenti in the liquor industry is losing interest in white whiskies, and when we showed up at [the venerable Manhattan wine and spirits merchant] Astor Wine and Liquors with our raw rye, they were a bit skeptical,” WIlliams says. “But they tried it and said, ‘We’ll take it.’ Getting shelf space at Astor is not easy, and we’ve re-upped them three times now. We’re running slightly under capacity right now; in the summer, we run our eau de vie, which is currently our only award-winning product. According to the American Distillers Institute, we make the best eau de vie of any kind in America. At the last ADI conference, we got best in category for our peach eau de vie, against maybe 60 other products. What’s fun about this is that there are so many permutations—it’s what’s fun about distilling in general. We can fill a barrel with Peach Eau de Vie, and then we can take that barrel and make a peach eau de vie barrel-aged whiskey."